Eliminate rust rings before they can even think about forming. 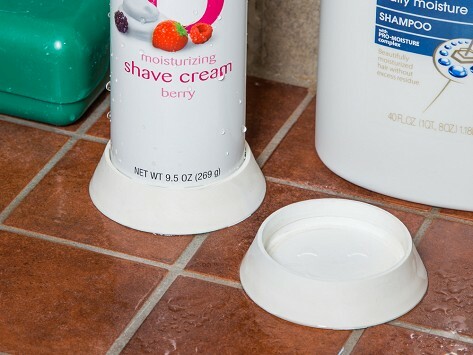 This grippy little base acts as a coaster, fitting snugly onto the bottom of cans like shaving cream, bug spray, or household cleaners. 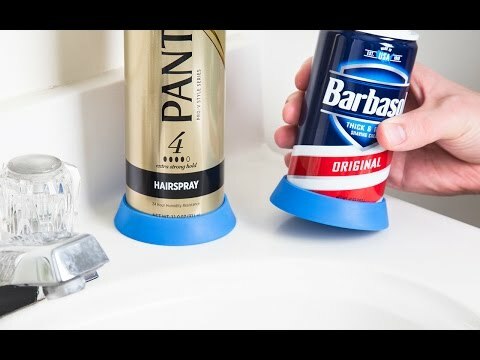 You can use it to corral condensation from soda and beer cans, too. Dimensions: 2.5" D x 0.68"
This thing is genius - works great for cans in the shower and for cola cans inside and outside! I highly recommend and will buy more! Saves the light grey shelves in my shower from getting stained! No more rust marks on the tub! Gripponz are the work of The Gadgit Girlz, Alita Guillen Haytayan and Celeste Nameth. They are geared up to solve the small but annoying everyday problems that bug us all. With simple but effective fixes like Gripponz, they’ve got us excited to see what they solve next.